VAM USA celebrates 30th anniversary serving the oil and gas industry. 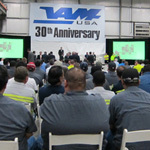 VAM USA LLC, the leading supplier of premium threaded connections for the oil and gas industry in the USA, celebrated its 30th anniversary today. The company hosted a gathering at its Houston headquarters to mark the event. Among the participants were customers, the board members from Vallourec, NSSMC and Sumitomo Corporation, the Group’s North American leadership, and all VAM USA executives. 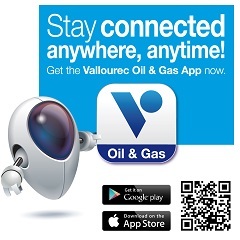 Since it was established in 1984, VAM USA has partnered with the onshore and offshore oil and gas sector. It has been a key product development and manufacturing center for the family of VAM® and Atlas Bradford® premium connections for shale oil and gas development, and the continued development of products for Gulf of Mexico operators’ toughest requirements.